New Hope Cumberland Presbyterian Church Cemetery, 904 Acorn Gap Road, Madisonville, Tennessee. Located on Monroe County road #328 across from New Hope Church, between Oak Grove and the old Loudon Road, on Bulging Branch (a tributary of Bat Creek), old Dist. 11, Monroe County Tennessee, about 5 miles North of downtown Madisonville near Sweetwater. If you have questions about interment or wish to purchase a lot call Roy Leslie: 865-740-5613. Beginning January 1, 2016, lots will be $500 each. The cemetery is a ministry of New Hope Cumberland Presbyterian Church. The church’s Cemetery Committee, led by Roy Leslie, is responsible for records, reports and its ongoing maintenance and perpetual care. NOTE: Since lot and interment fees do not cover the cost of perpetual care, families are asked to regularly make a voluntary donation to the cemetery to cover maintenance costs. Madisonville, TN 37354-0422 Thank you for your support! To provide for the perpetual care and maintenance of the cemetery, the New Hope Cemetery Committee is asking for your help in creating an endowment. You can help by including New Hope Cemetery in your will or as a beneficiary of a trust, retirement plan, or life insurance policy. Please contact us if you have made a bequest or named New Hope Cemetery as a beneficiary so we can include you in our annual report. This cemetery was begun a few years after the church was formed in 1868. The first parcel was donated by the Moser-Airheart family who at the time owned the land across the road from the church. The Boring family donated a portion in August 1966. Brenda Leslie donated land in August 2004 extending the cemetery back three rows. We hope this online cemetery listing will assist you in your family history and genealogical research. This is a work in progress, so please notify us of any corrections. Please consider a donation if you find this listing helpful. Cemeteries require continuous maintenance and your ongoing tax-deductible donations are needed and appreciated. Our 501(c)(3) tax ID# 80-0661387. Thank you. The original listing thru Feb 13, 2002 was compiled by Harless K. Brakebill, Jr., member of New Hope C.P. Church. Harless Krauth Brakebill, Jr., 82., passed on November 29, 2004. RIP. Additional information on families is shown when known. Submit family summary, questions, omissions and any corrections to . Airheart, Hester Samples:: 10-4-1878==6-6-1955-dau\Wm. S.
Airheart, James R. Jr.::11-28-1922==12-25-1983-s\J.R. Sr.
Airheart, Hazel H. :: 6-19-1928====== w\J.R. Jr.
Axley, Myrtle Huff:: ———– 1-15-2000 W\Hugh above. Axley, Ida Belle Cansler::1909-1963 above 3 names on same stone?? Blair, Margaret Cline:: 3-22-1875==7-30-1943- dau of jacob or John Cline.? Blair, David:: 8-2-1872==6-26-1892-s\Wm.& SE Bro To Thomas?? The Boring family donated an addition to the cemetery in August 1966. Boring, Chris Burger:: 1915==5-22-1996 ?? BRAKEBILL – Henry Brakebill and his son Wm. Brakebil, Sr. are ancestors of all Monroe county Brakebills (except for Joseph Brakebill brother of Wm. who is buried at NHCP) are not buried at New Hope but on a Knob above Bat Creek upstream from NHCP with Rachel brown wife of Henry. Luvina Moser Brakebill wife of Wm. Brakebill Sr. son of Henry and Rachel wife of Wm. son of H (this Family Brakebill Cemetery is on Anderson road). Peter Brakebill, 1760-1844 is buried in the Brakebill Cemetery on Nail Creek, Blount County, Tennessee with his wife Katharine Rorich Brakebill along with other Brakebills. Note: Md. twice:;Louisa Balnkenship–Fannie Pardue Blankenship, she and kids to Texas, Ca. Brakebill, Jane Blankenship Airheart:: 5-31-1815 ??==6-26-1896-W-Jos. dau of Spencer Blankenship-Mary Brewer-Widow John A.
Brakebill, Nancy Louisa Moser:: 3-17-1843==10-20-1902-dau Francis Jr. and Eliz. Brakebill, Nancy A.Barr:: 11-3-1869==6-25-1916- 2nd w\J.P. Brakebill, John Edward, (Big John):: 11-7-1846==12-12-1921, Mary Moser:: 10-8-1849==7-16-1936- 3rd w\John-dau Noah M.&Mary Blankenship dau of old Spencer Blankenship. Brakebill, Robert Taylor:: 8-5-1889==12-26-1889-S\John E. ?? Brakebill, Mollie Jane:: 12-11-1890==6-19-1896 d\J.P. ?? Brakebill, Sidney Anne Lowry:: 2-22-1862==4-1-1921-d\H.K.Lowry-Isab. Brakebill, Theresa Blair:: 7-31-1897==7-13-1981-d\Thomas B-Marg. C.
Cagle, Stephen D.:: 10-21-1921===USA 31st Div. Cagle, Inez, M.:: 2-19-1888==5-1-1958 W\Jojn J.
Cline, George M.:: 1-3-1843==1-28-1917 S\John L. C.
Cline, Nellie Glenn:: 6-22-1916==7-11-1918 D\Benj. Cansler, Edith:: 12-26-1921==12-25-1988 she may be w\R. Turpin?? Collins, Sarah:: Buried Hopewell W\Perry L.
FRANK – This old family settled on waters of Island Creek and also near Fenders Church. They were of Germanic Stock and the ancestor of them is Wm. w\above,widow of Jacob Summitt, dau of Jacob Cline. Called Ttney Alice. Frank, Grace C.:: 4-4-1896 ===== W\Robert L.
GREEN – I believe the first Greens settled in Shortbark area. Green, Martha A.:: 6-10-1865==12=9-1947 W\L.C. Green, Opal Pearl:: 4-9-1923==12-20-1994 (could be W\Albert Frank?? Gourley, Robert J.:: 1-23-1918==3-18-?? cant make it out? Huff, Oll:: 11-18-1905==12-28-1983 W\Eva Mae Leslie lived on Loudon road. Kittrell, Mary Louisa Pressley:: 1824==11-20-1898 W\Solomon A.
Hansen, Mrs Grace:: 1904==1979 ?? Gossage, Ice B.:: 9-24-1887==10-16-1909- W\E.B. HENLEY – Two sons of Thomas Owen Henley married Edington women, daughters of Sam Edington, early settler on hill above church on Coldstream farm rd. He built the brick house now owned by the Lay-Kittrell family about 1830. Jerry Lay and Wife Caroline Kittrell live there 1999. the Lays have owned this farm since about 1950. Thomas O. Henley and his dau Molie Henley and her husband Richard Henry Brakebill moved to Meigs County with other Henleys and are buried near Watts Bar in Hickory Gr. cemetery. Other Henleys and Edingtons buried on Lay farm in family cemetery. Henley, J. R:: 4-30-1836==3-20-1892-s\T.O. H.
A.H. Hicks is the father of Cordie H. Conner who is buried with her husband Rev. John Calvin Conner near Asberry’s grave. I believe AH Hicks to be an ancestor of Louise H. and son Dan Hicks. Louise had column in Madisonville paper about old days around New Hope. He was a member of NHCP and an officer of the church. Huskins, Mary Ann:: 3-27-1833==7-8-1922 W\John?? JOHNSTONS – This family came to the new Monroe county shortly after Cherokee Removal from Bo. County Several brothers to Fork Crk. Loudon, Sweetwater and Big Sam a 1\2 brother to Bat Crk. at Brakebill where he built one of the first grist mills in the new Monroe county They were of Scotch-Irish stock from the Carolinas. the old Johnston House which became the Burt Collins house is now gone Many Johnstons are buried in Glenloch Cemetery on Fork crk. I believe Jacob Johnston furnished lumber for the first frame New Hope church.?? Johnston, Charlie May:: 5-1-1899==10-31-1902 D\Wm. F.
KINSER – the Kinser family of Germanic ancestery; mostly Settled around St. Mary’s Lutheran church near McMinn County Line. they moved down from Greene county Tennessee. early 1820s. Most older ones buried there. Kinser, Cordie Brakebill:: 10-26-1878==1-7-1960 She Dau\John E.
Kirkpatrick, Alvin H.:: 9-14-1837==11-18-1923 – from Jeff. -Grainger Cos.
KELLAR – desc. From Phillip Keller and Katharine Moser of Hiwassee area. 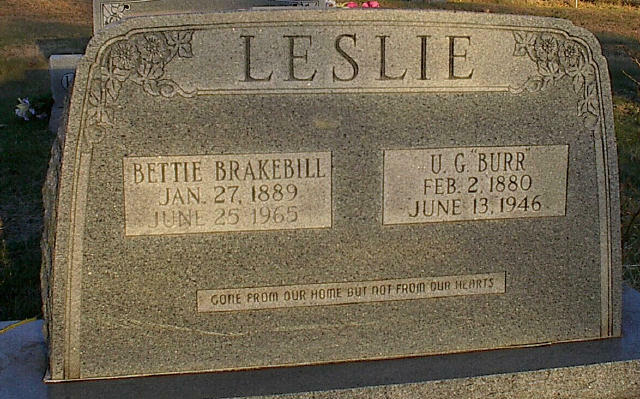 LESLIE – this family has been associated with New Hope since James Wiley Leslie and Nancy Lee moved to the old Albert Lowry place on Loudon Road where descendents lived until ??. They previously lived in the southern part of Monroe, prob dist 8. They are of Scotch-Irish stock from the Carolinas. Family members are still active in New Hope Church today. Logan, Nellie P.:: 7-27-1891==6-19-1909 D\P.W. Lynn, Johnny J.:: 5-28-1919==7-22-1977 (request for removal of body to Florida) Feb 13-2002??? Kyker Sweetwater to do job? MOSER – this family desc of Francis Moser, 1-Rev. soldier, 1763-1836, buried Old St. Paul Lutheran. He ancestor of all Mosers-Summitts Monroe County They from Bavaria to. Phil. To NC to East Tennessee. Francis Moser 4 buried here son of Francis Moser Jr. (the Moser-Brakebill-Airheart House and farm on hill above rd on way to Oak Gr. church. Old Francis had three sons and one dau to settle in Monroe county Francis Jr. John, and Peter and dau Sarah Moser who md. Daniel Summitt. Three Brakebills md. Children of Francis Jr. On Hill. Moser, Francis 4:: 5-23-1847==2-28-1919 Son of Francis M.Jr. Moser, Betty Kittrell:: 11=24=1862==5-20-1907 (dau of Wm. Kittrell,?? Moser, L.J. (Long John):: 2-10-1825==2-10-1905-S\Peter, S\Francis 1, etc. Moser, Avan:: 4-1-1896==10-14-1918 USA WW2, Killed? Moser, Georgia Anderson:: 11-2-1898==6-27-1994 D\Geo A.?? Desc. of Rev. Jos. Peeler who helped form NHCP. Pickelsimer, Martha J.:: 11-4-1859==9-20-1941 W\J.P. Turpin, Katie A.:; 3-26-1898==10-28-1972- W\Orvie A.
Warhurst, Betty Jo Isbill, Nee Wayman dau of Clarence &Sue Peace b-1940-4-18-2002 (husband Warhurst decd. Div fr. F. isbill, prob div fr. War. Ex-wife of James Frederick Isbill (divorced) 2nd husband Don Warhurst ??? WOLFE – this well known family has been involved with New Hope close to its beginnings. The first Wolfe of this family in Monroe County settled upstream from New Hope near Anderson Rd. He and wife and sons Joaquin Wolfe, and His wife Sarah Moser and son John Wolfe are buried in Hiwassee Cemetery called Buckners. son John is ancestor of Wolfes listed here. The son of John, John Peeler Wolfe buried here at New Hope w\many of his descendents. Wolfes are still living here and active in the church. Wolfe, Prudie Brakebill:: 2-22-1887==6-18-1952 W|above. D\Big John B.
Yearwood, Stephen Walter:: 7-28-1958==11-29-1958 S\Geo. W.
Visit www.findagrave.com for more photos of stones at New Hope Cemetery. Copyright © 2019 New Hope Cumberland Presbyterian Church.